To access it you have to navigate to the PixiePanel/ Gallery/ Gallery Settings. This where you change the gallery background for the gallery. To change it, simply click CHOOSE BACKGROUND and upload an image to your media library & save it. Recommended image size: 1920x400 pixels. Note: If left blank, the default image will be displayed. Gallery Title - The topline text a.k.a header text. Heading - The bottom line text or the subtitle. 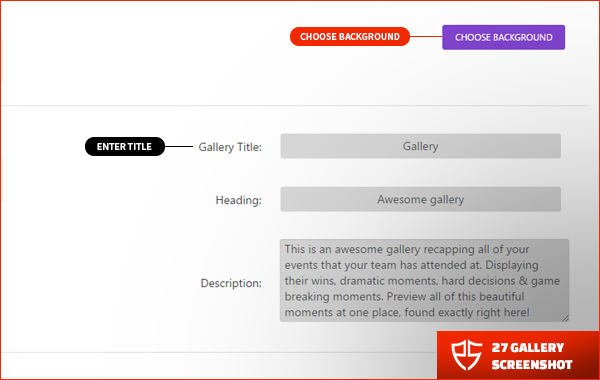 Description - A small description of what you’re going to display on your gallery.